Not only did Detroit Firefighters Association President Mike Nevin not stay in his lane, he doubled down, releasing internal police documents that show it took police the better part of an hour to respond to an active murder scene. A scene where panicked firefighters were pinned down. Craig assembled a press conference, where he claimed that police responded to the call in six minutes. Then it was the chief’s turn to double down. Craig announced he was seeking criminal charges against Nevin for disseminating “sensitive information to the public,” which included the name of a potential witness. When the Wayne County Prosecutor’s Office kicked the request back to police internal affairs for lack of information, Nevin was notified that he was now the subject of an internal city investigation. Lost in all the posturing and finger-pointing and threats was the truth. How long did it take for police to respond? What can citizens expect when they call for help? 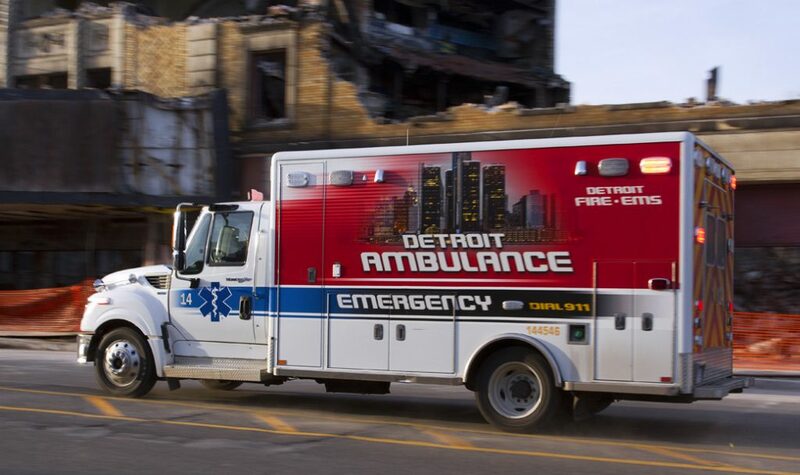 A joint review by Deadline Detroit and Motor City Muckraker of police reports, 911 dispatch logs, radio transmissions of the incident and interviews with those on the scene reveals a jumble of confusion and omissions. What the data clearly shows, however, is that Craig’s statement of a six-minute response by police to a homicide scene is simply untrue. It was 1:37 a.m. on Nov. 23, a Friday, when the distress call came. A man was severely bleeding, possibly stabbed, near the corner of Warren and Junction on the city’s west side. The caller was hysterical. Event reports show that police, fire and EMS were notified to respond at “priority 2,” defined as an emergency in progress or having just happened, while the perpetrator may still be on scene and emergency medical service may be needed. The police department claims that the average response time to priority 2 calls is 23 minutes. But our analysis of 800,000 calls showed it be more than 54 minutes when “officer initiated stops” – traffic stops, which have a response time of zero – are factored out. Engine 34 and an ambulance were dispatched to the corner of Warren and Junction avenues, but were told to stage a safe distance away until police arrived. Unwittingly, the firefighters drove directly into a fresh murder scene at Epsworth and Warren, unrelated to the first call, about two blocks from the location. It was a gory scene. The driver of a van had a fatal gunshot wound to the head. His seat belt was unfastened. A woman covered in blood was hysterical. The passenger door was open. Over the next 13 minutes the commanding officer of Engine 34 called repeatedly for police, warning of suspicious characters in the shadows. “A person of interest,” he called it. According to internal documents and recordings, an available police cruiser could not be found for nearly 20 minutes, since only three cars were assigned to patrol the 10th precinct that evening. All were busy with other runs. Eventually scout car M0208 responded to the Warren and Junction call – again, two blocks away from the homicide on Epsworth Street that firefighters had rolled up on and called in. Car M0208 made the Warren and Junction stabbing scene at 1:59 am, or 22 minutes after the initial 911 call, according to internal documents. What is strange is that car M0208 was not rerouted to the homicide scene at Epsworth, despite the fact that dispatch was aware of it. Consider that nine minutes earlier – at 1:50 a.m. – the commanding officer of Engine 34, radioed dispatch to verify that the man with the gunshot wound to the head was indeed a homicide victim. But M0201 did not make the scene at Epsworth until 2:12 am – a full half-hour after the initial 911 call – and 22 minutes after the homicide was confirmed – and 18 minutes after it had been dispatched. Around 2:15 a.m., a dispatcher can be heard on a recording asking for a backup scout to help car M0201 at the Epsworth murder scene. According to 911 logs and police run sheets, car M0208 – the unit that responded to the first call at 1:37 at Warren and Junction – finally made the Epsworth homicide scene at 2:25 am. There is no record of an incident or injuries at the corner of Warren and Junction. Despite all this, Asst. Chief of Police David LeValley said it was squad car M0208 that made the scene in six minutes once the homicide at Epsworth was confirmed by firefighters. Even if that is true, a car could have only responded nine minutes later, not six, as Chief Craig twice told the public. 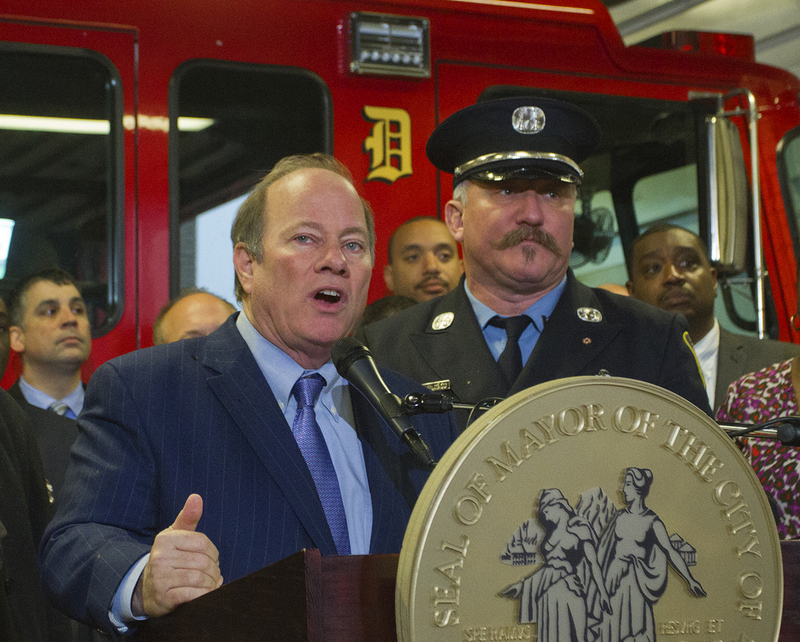 Mayor Mike Duggan and Mike Nevin, president of the Detroit Fire Fighters Association. Photo by Steve Neavling. The episode lays bare what Detroit first responders already know: Overburdened police officers are working for an understaffed department. Again, only three scouts were working the precinct that night. It should be noted that before Detroit’s municipal bankruptcy, the average number of cars working the city was five or six per precinct. Even then, the coverage was considered woefully insufficient. Craig and Mayor Mike Duggan denied repeated requests for an interview. Without firearms or ballistic vests, medics and firefighters often find themselves watching in horror as large crowds gather around a bleeding victim. Tired of waiting for police, medics approached a car where a woman was reportedly stabbed in the head at shortly after 9 pm on Dec. 21. Blood covered the side of her face, but the woman refused to open her car door until police arrived because the perpetrator was nearby. Finally, 28 minutes after the stabbing was reported, police arrived. When multiple people were injured in a three-car accident on Gratiot and State Fair at 11:15 pm on Jan. 4, crowds swelled as downed power lines snaked across the darkened sidewalk and a parking lot. Police arrived about a half hour later. During rush hour on East 8 Mile Road Dec. 17, the victim of a car crash, ejected from the vehicle, lay on the road. As medics and firefighters scrambled to help, police were unavailable. A few citizens hopped out of their cars and helped control traffic. Read the first part and second part of the series.